My daughter and I traveled to Belize for Easter break. We packed an extra suitcase with school supplies, including: paper, pencils, rulers, flashcards, and book bags, etc., for the school the Turtle Inn supports in Placencia. The school was the second stop on our trip. First we went to Blancaneaux Lodge which is in the Mountain Pine Ridge Reserve near the Guatemalan border, about a three-hour drive from Belize City. (The last hour of the drive is on a dirt road–emphasis rocks.) Both are Francis Ford Coppola resorts. While reading the hotel newsletter about how they grow their own food, generate their own power, etc., I noticed they mentioned they support Pack for a Purpose. Because it was Easter, the schools were on vacation. We knew we would need to leave the supplies we brought for the school supported by the Turtle Inn at the hotel, which would deliver the supplies to the school when it reopened. 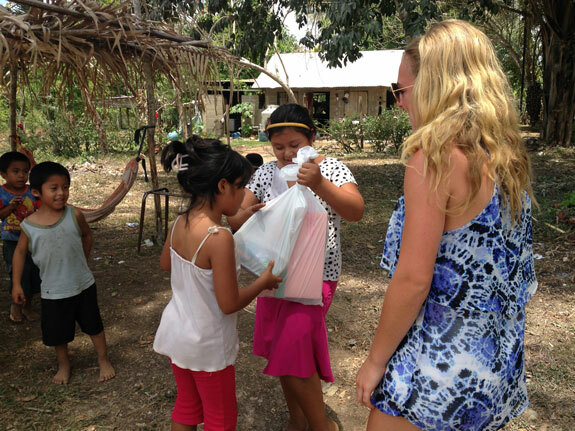 However, we did get the opportunity to visit a family and deliver some supplies directly. At the Blacaneaux Lodge we were told that the staff helps some local families. Our driver from the hotel, who was Mayan and who we used to get to local ruins, caves, etc., took us to a family in need. He knew that their five children would greatly benefit from receiving some of the supplies we brought. It was especially meaningful as I wanted my daughter to experience the act of giving. It brings tears to write about it now. The joy those children expressed was overwhelming to us. Thank you for giving us this experience.